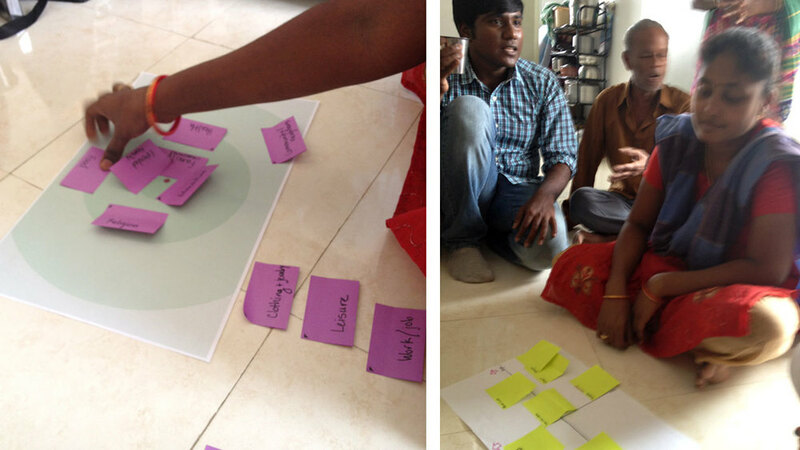 In partnership with Ashoka, a global association of leading social entrepreneurs, our team spent a ten-day research trip in Bangalore, India. We investigated the living needs of low-income housing dwellers in India in order to design innovative furniture and living systems for India’s estimated 130 million-person user base. As part of our field research, we visited an affordable housing community on the outskirts of Bangalore called Jaandahar. The first phase of the development was nearing completion and new homeowners had just begun moving in to the finished apartments. Graciously, a woman named Jothy and her mother-in-law Prema gave us a tour of the new home they had just moved into. They were still in the process of unpacking their belongings and they had not had an opportunity to purchase any furniture yet, but Jothy described the decorative wooden bed she would like to save up for. Like many Indian families, Prema, her husband, and their two-year-old son Sabareesh unroll a mat and sleep on the smooth, cool floor in the bedroom, while Sabareesh's grandparents do the same in the living room. As we met with more families that invited us into their homes, the conversation about their desires to have a cot or raised bed in the bedroom seemed to be a common theme. In India, not only does a bedroom serve as a place for sleeping, but (as we were informed by Jacob Matthew of Idiom Design Consultancy) also serves as a space for women to entertain their female guests. A raised bed is a showpiece and acts as a divan to lounge upon just like a sofa might serve in the living room. A raised bed is a status symbol, providing women and their family a sense of pride when friends and family come to visit. When we asked participants to give value ratings for home goods, a bed or cot was always at the top of the list, but was almost always the last item purchased (if at all) because the cost and size was prohibitive. In homes that did have cots, they where single-sized, making them inefficient to accommodate the family needs. On a visit to a silk facility, we made our way down a dirt road flanked with small colorful houses and topped with dried palm-thatched roofs. Our group of 15 students, faculty, and film crew stood out as we worked our way through the village, snapping photos of goats and chickens in the road, ornately decorated doors, and gates of what we assumed to be houses. As we made our way to the factory, we began to see the faces of women and children pop out from windows and doorways, curious about us and our purpose in their village. Everywhere we visited in India, people have been warm and gracious and our visit to this factory was no exception. When we arrived, we were cheerfully greeted by the factory manager who offered us cups of orange Fanta. While sipping the sweet soda, we watched as men and women worked diligently at their stations, unwinding silk threads from cocoons. The silk worm cocoons are purchased locally at auction from local growers, boiled to loosen the 350 meters of thread which is spooled into skeins, and then sold to weavers who will dye and weave the fine silk into rich textiles. The remnants of the cocoon are dried and spun into jute ropes, while the worms are sold to the fisheries. After leaving the factory, I became aware that the entire road we had walked up was lined with silk factories, not houses like I’d originally thought. Through open doors and windows, I could see people busily going about the same tasks of boiling and unspooling the silk threads we had just seen up close. By the time we reached our vehicles, word must have gotten out that we might have chocolates. The kids no longer peaked shyly through doorways, but approached bravely and smiled for photos as they requested sweets from us. I couldn’t help but wonder if these children had been working in the factories that we had just visited and the many others we had passed while walking down the dirt road. At Dovetail Furniture Design and Manufacturing facility, we saw how contemporary Indian furniture is being made. The factory was started because there were no other factories with the modern capabilities to create quality, modern furniture. Even in this modern factory, tradition and culture are still very apparent: men worked on the ground assembling furniture, and wearing shoes was optional. Maya Industries has created a sustainable business model that combines traditional Indian toy making craft with a social innovation. Motivated to help reduce child labor, employees are given free training and fair wage as long as they enroll their children in school. Using simple lathe techniques, natural vegetable pigments, and lacquer, a variety of high quality toys are produced. We couldn’t leave the factory before ordering a large amount of these exquisite toys for ourselves! A major consideration for designing large furniture items is how a consumer will transport them from the marketplace to their home. Rickshaws and motor bikes are the preferred mode of transportation and while truck delivery is available, it adds considerable cost.